We’re back! It’s the official kickoff event for The Dude Hates Cancer 2017. This year we’re kicking off with a Dude-like late happy hour and quizzo event! The Dude Hates Cancer 2017 Kickoff and Quizzo! Quizzo starts at 7:30 PM, free to enter, win cash prizes! We’ll be registering teams with a discount, and we will have BarLy’s famous quizzo with a Big Lebowski round! 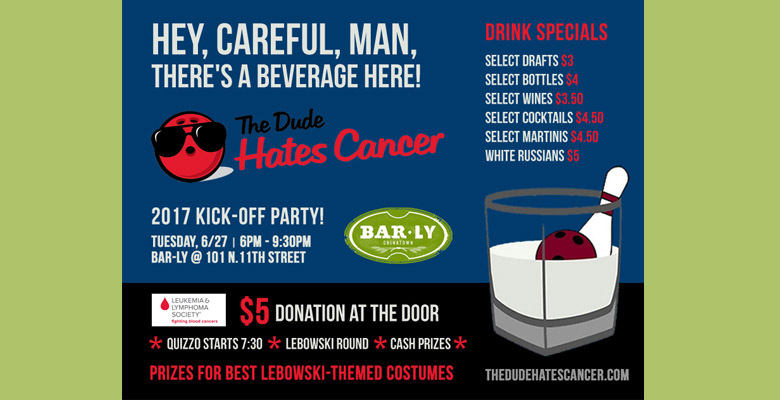 For a $5 donation to fight blood cancer, you get a wristband with carefully curated drink specials, which will include $5 White Russians – the best in the city! RSVP and share the event page on Facebook – click here. If you’ve rolled before, text your team and make this a night out! If you’re a first timer, stop by and say hello – we want to meet you! Next → Next post: Tin Lizard Brewing Event – August 29 – Featuring a Dude Inspired Beer!